The castle is quite literally the heart of the city and serves as a useful method of orientating yourself if lost in the streets below. Originally built way back in the 15th century, it was said to be impenetrable, until it turned out it wasn’t when it was ravaged during the Satsuma Rebellion in the late 19th century. Whilst the current building is a restoration (much like many of Japan’s castles), original structures still exist in the castle complex. Even if she has had a bit of work done, we still think she’s beautiful. 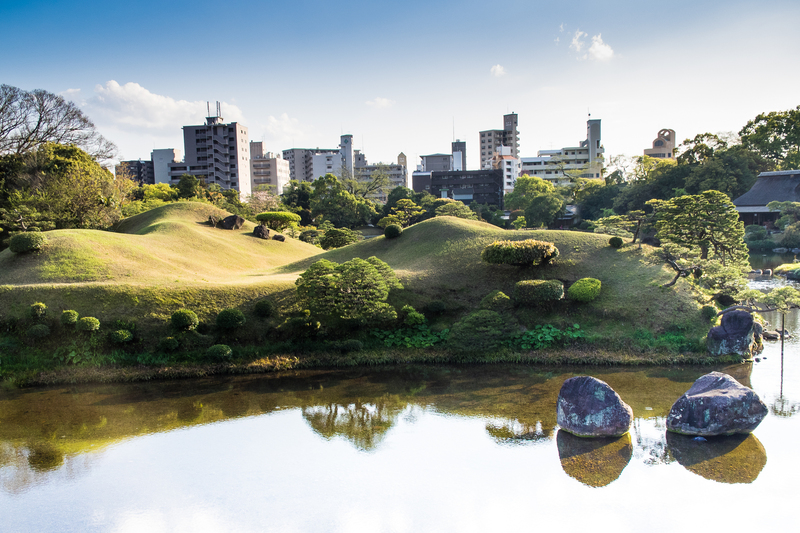 An island of serenity in the bustle of the city, Suizenji Garden is an enthralling place to wander lost in thought. The scenery reflects some key landmarks in Japan, such as a satisfyingly pointy green hillock made to look like Mt. Fuji and a path resembling an ancient trade route between Tokyo and Kyoto. The spring water is crystal clear and populated by peckish carp – just the way it should be in Japan. If you like living dangerously, pay a visit to Mt. Aso, Japan’s largest active volcano. Mt. Aso rises out from a spectacular national park which is accessible from Kumamoto city by train and cable car. This cantankerous old fella is still very much alive, croaking sulphuric acid out into the atmosphere which can lead to the mountain being closed off. If you’re lucky though, you’ll be able to get right up close and look into his steamy innards. Definitely one to tick off the bucket list. If you love Kumamon, check out our kawaii Kumamon merchandise including Kumamon noodles and Kumamon origami paper. Kumamoto Prefecture is blessed with an incredibly nutrient-rich landscape thanks to the presence of old volcanic Aso san. This means pure spring water and fertile lands – surefire signs of a glorious place to eat and drink. Looks delicious doesn’t it? But before you book your flight tickets to Kyushu and gobble up the first red meat you see, listen up. 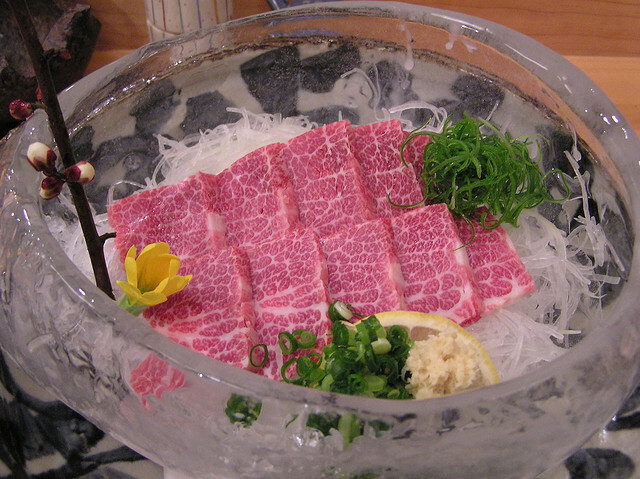 This is basashi – raw horse meat. Legend has it that when Kumamoto castle was under siege the folk began to starve, until they turned their hungry eyes to their hoofed friends in the stables. Ever since this has been a delicacy, sometimes called ‘sakuraniku’ (桜肉) or ‘cherry blossom meat’ due to its vibrant colouring. Super succulent, this is melt-in-the-mouth meat that beats your local neighbourhood takeaway any day of the week. 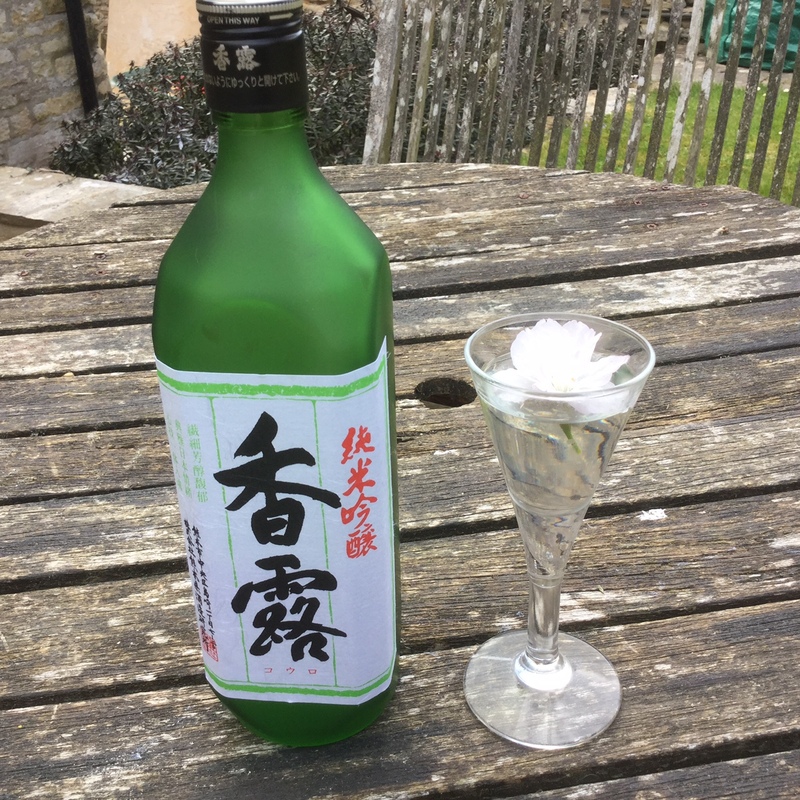 Often thought to be the pinnacle of sake greatness, KOHRO heralds from Kumamoto but is renowned by sake drinkers worldwide. Check our blog post to find out more about why this tipple is so special. 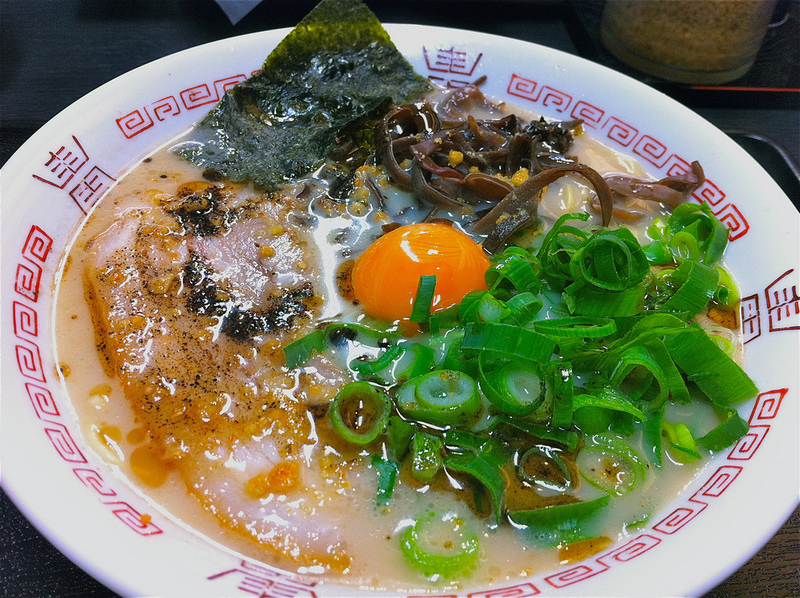 Kumamoto ramen is a favourite of ramen fans all over for its unique take on tonkotsu. Here, chicken stock is added and the resulting broth is rather creamier and lighter than in neighbouring Fukuoka Prefecture. If you visit Kumamoto, be sure to seek this out and slurp it up. With terrific food, in-tact history and stunning nature, Kumamoto has to be one of our top tips on the island of Kyushu. Credit to NF303 at flickr for the ramen image. Credit to our Kaicho Tak Tokumine for the KOHRO sake image. Credit to earthhopper at flickr for the basashi image. Credit to William Cho at flickr for the beautiful aerial images of Aso National Park and the view from Kumamoto Castle. Credit to Kanko at flickr, Nagasaki University Library and Emil Assman Mackenzie for the Kumamoto Castle images. Credit to Rita Willaert at flickr for the Suizenji Garden image. 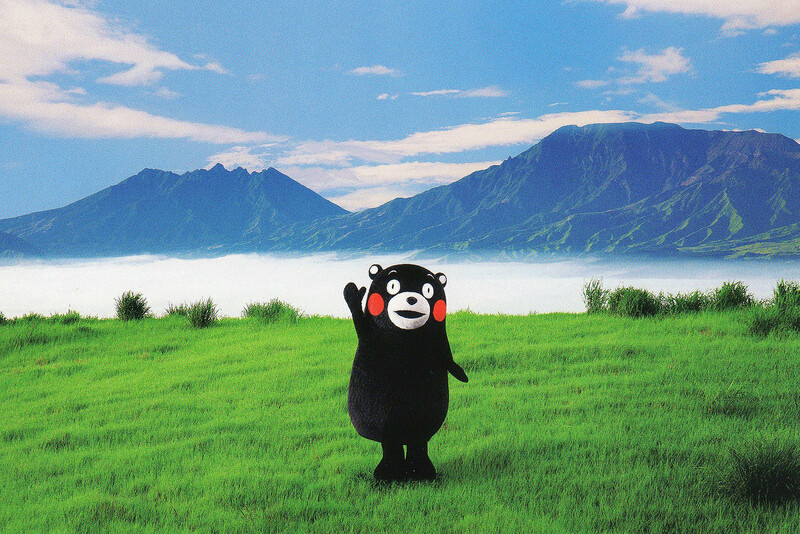 Credit to Chika at flickr for the Kumamon image. Posted in Travel and tagged Basashi, japanese, japanese culture, Kumamon, kumamoto, Kumamoto castle, Kumamoto ramen, Mt. Aso, Sake. Bookmark the permalink.